Alfred’s has several private and semi-private rooms to provide the perfect setting for your special event. Start planning by emailing us at info@alfredssteakhouse.com or call 415-781-7058. Located downstairs from the main dining room, the Owl & Turtle Room is ideal for larger groups of up to 60 guests for a seated dinner or up to 100 guests as a standing cocktail reception. The room is wheelchair accessible with an elevator. Private restrooms downstairs. Private bar available. Presentation availability. Baby Grand piano. Located downstairs from the main dining room, the Foxes’ Den is ideal for private dining groups of up to 18 seated guests and up to 30 guests for a standing cocktail reception. The room is wheelchair accessible with an elevator. Private restrooms downstairs. Private bar available. Presentation availability. Located upstairs, this fully private boardroom style space can accommodate up to 22 guests as a seated dinner or 30 guests as a standing reception. 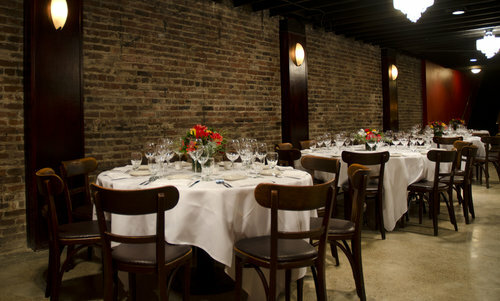 The Merchant Room is ideal for intimate events from client meetings to rehearsal dinners. Staircase access only. Private restroom located upstairs. Presentation availability. Located upstairs, this smaller private boardroom style space can accommodate up to 14 guests as a seated dinner or 20 guests as a standing reception. Staircase access only. Private restroom located upstairs.